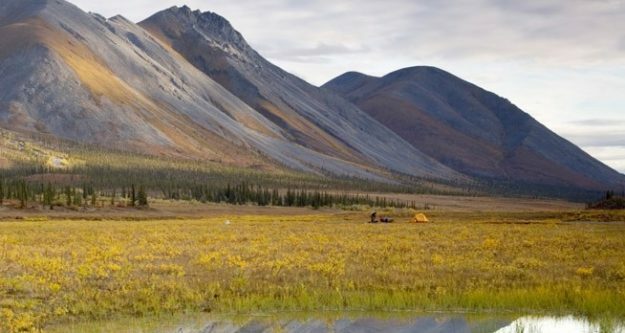 Last year’s Trump tax bill also opened up the Arctic National Wildlife Refuge to oil and gas drilling (U.S. Fish and Wildlife Service photo). Outdoor clothing and gear manufacture Patagonia on Wednesday announced it’s giving the company’s $10 million windfall from last year’s “irresponsible tax cuts” to groups “defending our air, water and land,” as well as to the regenerative organic agriculture movement. The announcement comes on the heels of Friday’s National Climate Assessment from 13 Trump administration federal agencies that predicts widespread human displacement and death, as well as economic and ecological catastrophe, if man-made global warming continues unchecked. The report flies in the face of the denials and fossil-fuel-friendly policies of President Donald Trump. “Our government continues to ignore the seriousness and causes of the climate crisis. It is pure evil,” Patagonia founder Yvon Chouinard said via a spokeswoman on Wednesday. “We need to double down on renewable energy solutions. “We need an agriculture system that supports small family farms and ranches, not one that rewards chemical companies intent on destroying our planet and poisoning our food. And we need to protect our public lands and waters because they are all we have left,” Chouinard added. Patagonia CEO Rose Marcario, in a post on Linkedin, did not identify what organizations would receive the $10 million, but she did say the new money will be on top of the company’s ongoing 1% for the Planet annual giving. Patagonia, which has been active in public lands issues in Colorado and Utah, labeled the Trump and Republican Party tax cuts a windfall for the oil and gas industry that will open up 19 million acres of the Arctic National Wildlife Refuge for drilling at the worst possible time for the planet. Colorado Sen. Cory Gardner, a Republican, has not yet issued a statement on the National Climate Assessment via press release or social media. Also in Congress on Wednesday, a bipartisan group of lawmakers in the U.S. House for the first time in nearly a decade introduced a bill to impose a carbon tax. The bill has little chance in the Republican-controlled Congress, but its bipartisan nature, with Florida Republicans onboard, underscores a sense of increased urgency in the wake of deadly flooding and wildfires. The House in 2009 passed a carbon tax and renewable energy bill under the leadership of then House Speaker Nancy Pelosi, who is poised to resume that role in January, but the Senate never even considered the bill. In other congressional conservation news, 22 members of the International Mountain Bicycling Association (IMBA) are flying to Washington today (Thursday) to meet with lawmakers to emphasize the importance of fully funding and permanently renewing the Land and Water Conservation Fund. Congress last fall allowed the expiration of LWCF, which for decades has collected fees from offshore drilling and used them on open space, parks, recreation facilities and other conservation projects across the country. The fund is losing nearly $2.5 million per day since it expired. Among the 15 congressional offices the mountain bikers will visit are Sens. Gardner and Bennet, Mark Warner and Tim Kaine of Virginia and Maria Cantwell of Washington. The group will also meet with Colorado Reps. Diana DeGette, Scott Tipton and Ed Perlmutter.